GearWrench 3/8" drive 6 point SAE standard 13 piece socket set. GearWrench 3/8" drive 12 point SAE standard 13 piece socket set. GearWrench 3/8" drive 6 point SAE mid length 11 piece socket set. GearWrench 3/8" drive 6 point SAE deep length 11 piece socket set. GearWrench 3/8" drive 12 point SAE deep length 11 piece socket set. GearWrench 3/8" drive 6 point 14 piece metric standard socket set. GearWrench 3/8" drive 12 point 14 piece metric standard socket set. GearWrench 3/8" drive 6 point 14 piece metric mid length socket set. GearWrench 3/8" drive 6 point 14 piece metric deep socket set. GearWrench 3/8" drive 12 point 14 piece metric deep socket set. GearWrench 3/8" drive 6 point 7 piece SAE flex socket set. GearWrench 3/8" drive 6 point 10 piece metric flex socket set. 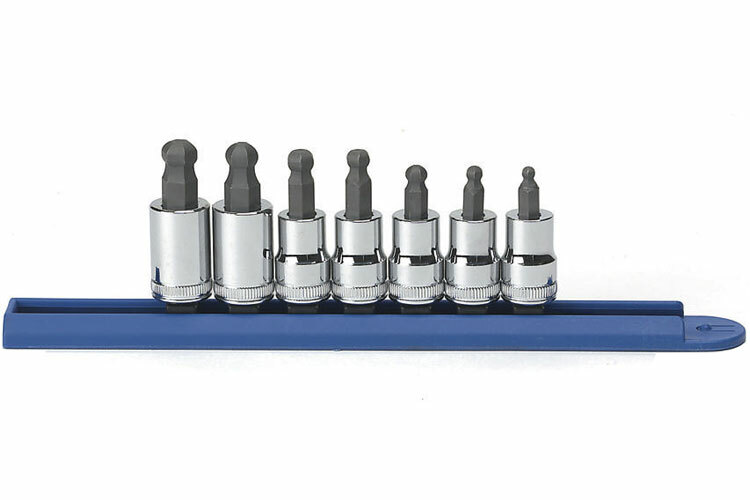 GearWrench 3/8" drive sae 12 piece hex bit socket set. GearWrench 3/8" drive metric 12 piece hex bit socket set. GearWrench 3/8" drive sae 7 piece hex ball end bit socket set. GearWrench 3/8" drive metric 7 piece hex ball end bit socket set. GearWrench 3/8" drive metric 8 piece hex long ball end bit socket set. GearWrench 3/8" drive SAE 7 piece hex long ball end bit socket set. GearWrench 3/8" drive 7 piece slotted/phillips/pozidriv bit socket set. GearWrench 3/8" 3 piece drive torx brake bit socket set. GearWrench 3/8" 3 piece drive SAE/Metric hex bit socket set. The 80587 GearWrench 3/8" Drive Metric 7 Piece Hex Ball End Bit Socket Set is one of thousands of quality tooling products available from MRO Tools. Please browse GearWrench 3/8'' Socket Sets for tools similar to the 80587 GearWrench 3/8" Drive Metric 7 Piece Hex Ball End Bit Socket Set. 80587 GearWrench 3/8" Drive Metric 7 Piece Hex Ball End Bit Socket Set description summary: GearWrench 3/8" drive metric 7 piece hex ball end bit socket set. 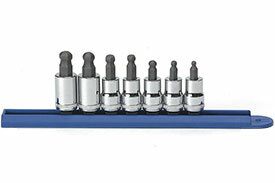 Quantity discounts may be available for the 80587 GearWrench 3/8" Drive Metric 7 Piece Hex Ball End Bit Socket Set. Please contact MRO Tools for details.